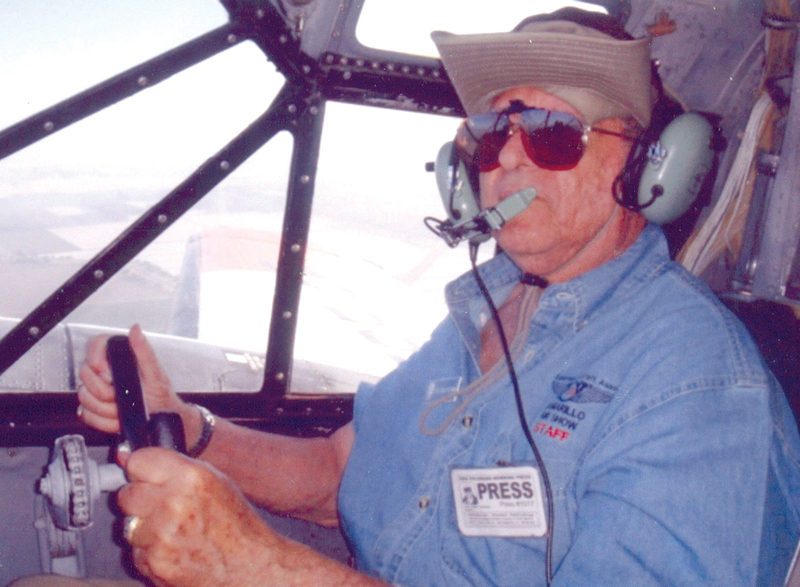 The Fred Baron in his Camarillo Air Show volunteer hat and shirt at the copilot controls of Twin Beech RC-45J during some fun maneuvers. I’ve had three flights in a WWII Twin Beech—two in 1951, and one at Camarillo Air Show 2004. On the recent flight and on one of the 1951 flights, I took the controls as copilot for part of the flight. On the other 1951 flight, I was supposed to fly the plane, but the flight was aborted for a very unforgettable reason. I’ll tell you about that, and then I’ll tell you about the air show flight where I got to do some unusual maneuvers. I’d gone through Navy pilot flight training in 1949 and 1950, and earned my “Wings of Gold” in late August 1950. During that time, I’d practiced many instrument flights in SNJs, F4U Corsairs, and Link trainers, and was qualified for low-frequency radio-range approaches (which don’t exist any longer),GCA (ground controlled approach),and regular instrument flying in bad weather. While I was in my fleet squadron, VF-14 “Tophatters,” flying the single-engine, single-cockpit F4U-5 Corsair, we were required to get a check ride doing low-frequency radio-range approaches in what was generally referred to as the “Twin Beech,” but the Navy designation was the SNB. Various models of the SNB were produced for instrument, navigator or bombardier training, as well as photo reconnaissance. My flight on May 11, 1951 (I just checked my Aviator’s Flight Log Book) was in SNB Serial Number 67287, equipped for practicing low-frequency radio-range approaches on instruments. The pilot in command acted as safety pilot, while the student flew with a hood to block the outside view, but allowed him to see the instruments. Old-time pilots will recall the old four-ledged beams (I seem to recall the term “Adcock Range”) with four quadrants that alternately transmitted a Morse code A (dot-dash) or N (dash-dot). When the signals overlapped, you were “on the beam,” although it took special procedures to know if you were inbound to the transmitting station, or outbound, and on which of the four beams! If you were on a beam inbound, you’d reach the “cone of silence” as you passed directly over the transmitter until you picked up the outgoing beam or code signal. Usually one of the transmitted beams led directly to an airport as part of the system of “airways.” The trick was getting on the correct beam inbound to the target airport. This was practiced frequently on the ground in the popular Link trainer. The Link operator had a table on which a mechanical “crab” moved over a map of the area in use as the student “flew” on instruments in the enclosed tilting and turning Link, trying to get on the correct beam and fly to the airport. On this SNB practice flight on May 11, 1951, there were five of us aboard the plane. The instructor or “pilot in command” was flying from the left seat, while a pilot being checked out was in the right copilot seat. In the airplane cabin were two more pilots (I was one of them) waiting for check-out, and a young enlisted sailor up for “flight skins” (extra pay by flying at least four hours in the month). The pilots being checked out would make (if my memory serves me correctly) two range approaches, then swap the right seat with a waiting pilot. My flying turn had not yet come up. We were flying on a hot day over marshy land, so the thermals made it a bumpy ride. We had made several approaches and let-downs and climbs (landing was not part of the check-out) when the sailor sitting next to me tapped me on the shoulder. I turned to look at him as he opened his mouth about to say something—and threw up all over me! Yuk! Add heat, bumpy ride, and vomit in the airplane, and we all got woozy, and aborted the flight. I never got in the right seat on that flight, but did a little over a month later on June 25, in SNB Serial Number 29553, when I passed the check-out instrument flight. That flight in 1951 was my last flight in a Twin Beech—until recently. I was volunteering at one of the four admission gates to Camarillo Air Show 2004, wearing the volunteers’ “uniform”: wide-brimmed Aussie hat and embroidered EAA #723 denim shirt. The show was over. All afternoon I had been watching a WWII Navy SNB painted with a Pensacola white and orange training command color scheme giving 15-minute rides for only $40—sometimes making high-speed passes over the runway and zooming up into a left turn. When the show was over, I spoke to the pilot/owner, Taigh Ramey, who operates Vintage Aircraft in Stockton, Calif. His company specializes in the maintenance and restoration of ex-military, antique and classic aircraft, including the Twin Beech, and also does cremation ash scattering. Taigh also maintains and operates “Old Glory,” a B-25 Mitchell bomber for the owner. I made arrangements with Taigh to fly in the copilot seat on the next available Twin Beech flight. Operating under a tent shading him from the sun, Michael Kirkley studiously arranged the flight schedule, with four passengers per flight, from the people waiting in line. Jim Ricketts helped load and unload the passengers for each flight. Ramey took digital photos in flight, which passengers could take home with them, produced as 4×6-inch glossies immediately after each flight with a digital color photo printer. I watched this smooth operation as I waited for my flight. The “Twin Beech” name refers to the Beechcraft Model 18 series, which includes many different models dating from the late 1930s into the mid-1960s. This particular Twin Beech is a Model RC-45J, originally built as an Air Force AT-7 navigation trainer in 1944, but it was diverted to the Navy as an SNB-2C, where it operated during WWII as a navigation trainer. It was overhauled and configured for service as a photo reconnaissance trainer in the 1950s, and served with the Navy’s Photo School at Pensacola, Fla., until its retirement to desert storage in 1972. After 24 years of storage, the airplane was acquired by Ramey, who made it airworthy once again while preserving the airplane’s unique and historical configuration and equipment. Powered by two 450-hp Pratt and Whitney R-985 radial engines swinging two-bladed Hamilton Standard full-feathering hydromatic propellers, this RC-45J, Serial #29585, in addition to the seats for the pilot and copilot, has three seats in the passenger compartment. Each seat has its own cabin window and headset. Two of these seats are immediately behind camera windows in the fuselage floor that allow looking out the bottom of the aircraft. Hundreds of aviation enthusiasts have enjoyed memorable rides in #29585. Finally, my turn came. Jim led four of us out to the waiting plane; as we stood by the cabin door on the left side of the fuselage, Taigh briefed us on how to buckle the safety belts, and the location of the emergency exits. I climbed in first, moved to the copilot seat, and squeezed in. It seemed to me it was roomier and easier to get into than over 50 years ago when I was more limber, and only weighed 135 pounds! The other three passengers climbed aboard and Taigh got into the pilot’s seat as we all connected our seatbelts. Taigh started both engines, taxied to the run-up area, and tested the magnetos on both engines. It was almost 6 p.m., and since the air show was over, some planes were still leaving, so after a short wait, we made a flaps-up takeoff. With the props in low pitch, an rpm of 2300, and a manifold pressure of 36 inches, we lifted off Runway 26 at 65 knots, heading almost directly into the low sun. Taigh held it low as he retracted the wheels and built up airspeed, then reduced to climb power of 2100 rpm and 33 inches of manifold pressure as he pulled up into almost a 30-degree climb into and above the sun, briefly leveled off, climbed to the traffic-pattern altitude of 1,000 feet above the ground, and made a steep left turn. That’s when he let me take over the controls. I maintained the turn and altitude until parallel and slightly south of Pleasant Valley Road, which was a good downwind position. Heading downwind at 130 knots, with 1800 rpm and 28 inches, we got tower permission for a high-speed pass over the runway. Incoming traffic kept us on the downwind until about a mile east of the runway approach. Finally, without Taigh changing the power settings, I banked it left and pushed the nose down; the airspeed increased to about 170 knots as we zoomed over the runway. After a steep pull-up into the blinding sun, we leveled off at 90 knots. I pulled it into a left turn as Taigh took over for a short approach and another high-speed pass followed by a steep pull-up and turn for a short approach—almost a carrier approach. Taigh dropped the gear and full flaps, and pulled the throttles back almost to idle as he slowed to an 80-knot approach speed, and greased the tail-dragger at 60 knots on to the runway just beyond the numbers. It was a great fun flight, and the photo wasn’t bad, either! For further information about Vintage Aircraft, visit [http://www.twinbeech.com/], call 209-982-0273 or e-mail taigh@twinbeech.com. 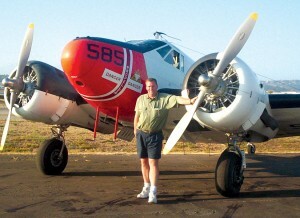 Taigh Ramey and his Twin Beech #29585, which was originally flown during WWII as an SNB-2C navigational trainer, but was later converted to its present RC-45J configuration as a photoreconnaissance trainer. You can take a ride in it for only $40.